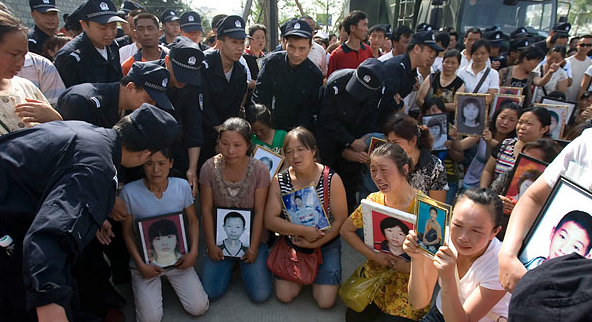 The above photograph, which anchored a story in the NYT, features the parents of school children killed in the earthquake in Dujiangyan (in the Sichuan province), as they are being confronted by the police (dressed in black). And one can see why the western media would be attracted to it, for the image is an almost perfect representation of occidental perceptions of the difference between totalitarianism and democracy as it portrays a black clad and masculine force quieting and controlling a feminized people (literally “brought to its knees”) clad in a wide array of colors that mark its pluralist and individualist identity. But there is, I think, a more interesting point to be considered if we focus more directly on the parents themselves and the fact that they are all clutching photographs of their dead children. The question, of course, is what are the parents doing? If one were to crop the parents’ faces it would be hard – at least to western eyes – to discern whether they are expressing mournful grief and sorrow or protesting a political or moral wrong. But, of course, their faces are not cropped and they all embrace photographs of their dead children, a posture which frames the meaning of the image even as it complicates the relationship between mourning and protest, imbricating the two in a single mode of social and political action. This relationship is accented by a set of photographs that appeared in the NYT and elsewhere of parents posing with pictures of their dead children in more or less private and physically isolated settings and locations. The tension in such images between the controlled but sorrowful gaze of the parent and the smiling faces of the children is palpable, producing a visual hybrid of more traditional photographic conventions that operates at the conjuncture of “offer” and “demand.” As with most of these images, the setting records a private world turned upside down—notice the overturned bookcase in the above photograph—which, when combined over and again across a series of such shots, is emblematic of a larger public disorder. And indeed, it is the repetition of the form in photograph after photograph that animates the affective force of the image. At some point in time the aesthetic might become a cliché, subjecting such photographic representations to theories of “compassion fatigue,” but here at least their inventional novelty seems to avoid this result. Such photographs are interesting for what they tell us about how protest might operate in political regimes where voices cannot be spoken with impunity, for they acknowledge the threat and potency of repressive silence even as they assert the power of something like a “public screen” to challenge and subvert controls on free speech traditionally understood. The people in such images recognize that they have little status to “speak” out in protest, even if such efforts did not put them at personal risk, which they obviously do. But, of course, being seen is a different matter. 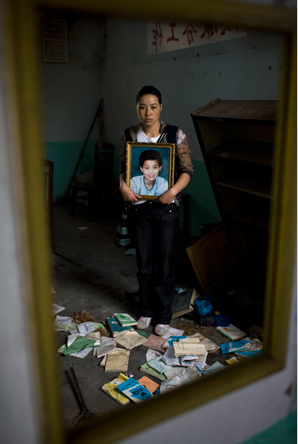 The point is especially pronounced in the above photograph of Zhao Xiao Ying and her twelve year old son Ji Qing Zhen, which foregrounds and underscores the political performativity of posing for such images; notice, for example, how the subjects in this photograph are visually thrice removed from the political present, even as as their political presence is accented by the photographic frame: what we have is quite literally a visual representation (a photograph) of a visual representation (mirror image) of a visual performance (posing for a photojournalist) that is equal parts private and public, and thus simultaneously an expression of personal grief and collective, political protest. Photo Credits: Ng Han Guan/AP, Shiho Fuakada/NYT; For discussion of the concept of the “public screen” see Kevin DeLuca and Jennifer Pepples, “From Public Sphere to Public Screen: Democracy, Activism, and the ‘Violence’ of Seattle,” in Critical Studies in Media Communication 19 (2002): 121-51. Are you saying that police surrounding demonstrators like this is, or is not, how these things happen in the US? Brenda: It’s a good question. And I do think that something comparable can (and does) happen in western style democracies (not just the U.S.) though it typically isn’t presented as such. Rarely do we see police cast as storm troopers dragging away grieving parents who otherwise appear to be peaceful and no threat to anyone (and when something like that does happen, as say, during the civil rights movement in Alabama, it is richly vilified as inconsistent with our commitment to democracy). I think it is that contrast that makes the top image attractive to western societies, i.e., it is not perceived as how we do things. The larger point, however, has nothing to do with why the image appears per se and what we might otherwise see occurring, i.e., the manifestation of a public screen – the inventional usage of both performing for the camera and using photography itself as a resource of political voice — that serves as a powerful and potent means of resistance. in an otherwise totalitarian regime that does not tolerate free speech. And, of course, this is not to say that western-style democracies don’t have their own problems with the ideal of “free speech” (think of the Bush administration’s usage of “free speech zones”), but it is to suggest that there are multiple ways in which political voice can be expressed even when free speech is repressed.